Five people were on Friday afternoon arraigned before the magistrate’s court in Nairobi and charged with several offences connected to the Tuesday attack at Dusit D2 hotel and business complex by Al Shabaab terrorists. 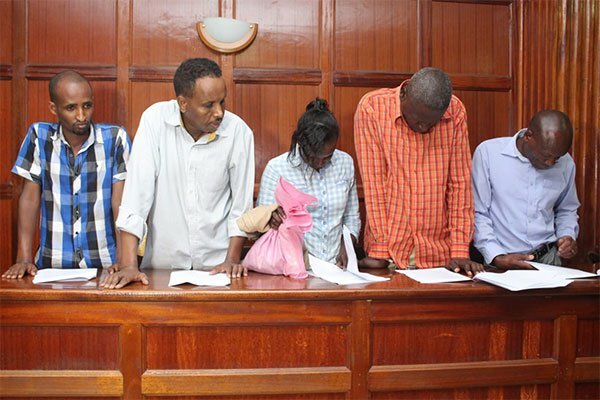 The suspects included Joel Ng’ang’a Wainaina and Oliver Kanyango Muthee, both taxi drivers, Gladys Kaari Justus who works at a money transfer service point, Abdihakim Mohamed Guleid, a Canadian citizen and Osman Ibrahim. The group treated as accomplices was arraigned before the magistrates court in Nairobi and charged with “aiding and abetting” the attackers of Dusit D2 hotel. The Director of Public Prosecutions for Kenya Noordin Haji asked court to remand the group for 30 more days as investigations into the case continues. “The investigations into this matter are complex and transnational and would therefore require sufficient time and resources to uncover the entire criminal syndicate,” a statement from Director of Public Prosecutions Noordin Haji said in his request to the magistrate’s court. The presiding magistrate later granted the request. The prosecution side also told court that security is still pursing more people suspected to have been part of the attack in and outside Kenya. Prosecution alleges that Wainaina ferried the attackers on several occasions around Nairobi whereas Muthee, a fellow a taxi driver drove one of the assailants to the scene of the attack. Kaari Justus is accused of transferring money suspected to have been used in the mission whereas Guleid Abdihakim who holds a Canadian citizenship is accused of making suspicious communication to Somalia. Osman Ibrahim is alleged to have met with one of the attackers on January 8, days before the attack happened. “The attackers were in constant communications with several phone numbers which are located in Somalia,” the prosecutors said. Al Shabaab early this week claimed responsibility for the Tuesday attack in Nairobi that left over 20 dead and others injured after gunmen attacked Dusit D2 hotel and business complex in Nairobi which has 101-room hotel, spa, restaurant and office buildings before an explosion targeting cars in the parking lot and suicide bombing went off in the foyer of the hotel. The attack prompted a 21 hour operation by Kenya’s security forces that ended on Wednesday with putting out of action of all the attackers whereas over 700 people had been rescued. President Kenyatta said on Wednesday that his government would not waiver under the attacks of terrorists but instead pursue them and bring them to justice. He said it is time for Kenya to show their undoubted resolve, adding that all terrorists have since been put out of action but their accomplices will be pursued. “We will seek out every person that was involved in the funding, planning and execution of this heinous act, we will pursue them wherever they will be and hold them to account,” Kenyatta said.